In which Claire, who doesn’t speak French, bakes her way through a French cookbook from 1962. What?!?! French cake a week? French cake every few months is more like it. It’s been a while. I got side tracked. But we’re back! And in keeping with the almost-forgotten tradition, we’ll talk about a French film as well as a French cake. This week’s offering is Séraphine. The film tells the true story of Séraphine Louis, a maid who has a secret passion for painting. She’s “discovered” by Wilhelm Uhde, a noted art critic who happens to be renting space in the house where Séraphine is employed. That’s the story of the film, but the film is truly about Séraphine herself; about her slow, quiet movements, about her passions and fears and loneliness. The film itself is slow and quiet, following Séraphine as she collects the materials to make paint, which is a mysterious and beautiful ritual. Séraphine is happiest outdoors, and her almost religious love of nature translates into her paintings, which are wild and vibrant and beautiful. Séraphine doesn’t paint for wealth or fame, she paints for the glory of god, and because she has to paint. She has a lush, vivid world inside of her head, and it spills out onto the canvas with a sort of ecstasy. She paints with her hands, with the power of her whole body, and the fervor of her fevered soul. And it’s another cherry tart! This one is quite simple, just fresh cherries (and bittersweet chocolate chips, which weren’t in the recipe but which I couldn’t resist adding) in a simple crust, with a sort of “cream” poured over. Sometimes simple is best–this was delicious. I had a little bad-tempered trouble trying to piece together the lattice, but I don’t think it needs to be perfect. It’s all getting eaten, anyway!! The soundtrack to Séraphine was lovely…deep and moving, and here’s a song from it. Make the dough: Mix the flour, sugar and salt in a bowl. Cut in the cold butter in small pieces. Mix with your fingers till it’s coarse and crumbly. Add just enough water to bring everything together into a smooth dough. Reserve about 1/4 of it for the top, and press the rest into a lightly buttered and floured 11 inch tart pan (or similarly sized baking dish). Chill for at least half an hour. Meanwhile, mix up the cream by whisking everything together in a big bowl. Preheat the oven to 375. Spread the cherries and chocolate in the chilled tart shell. Pour the cream over evenly. Sprinkle sugar over that. Roll the remaining dough and cut into thin strips. 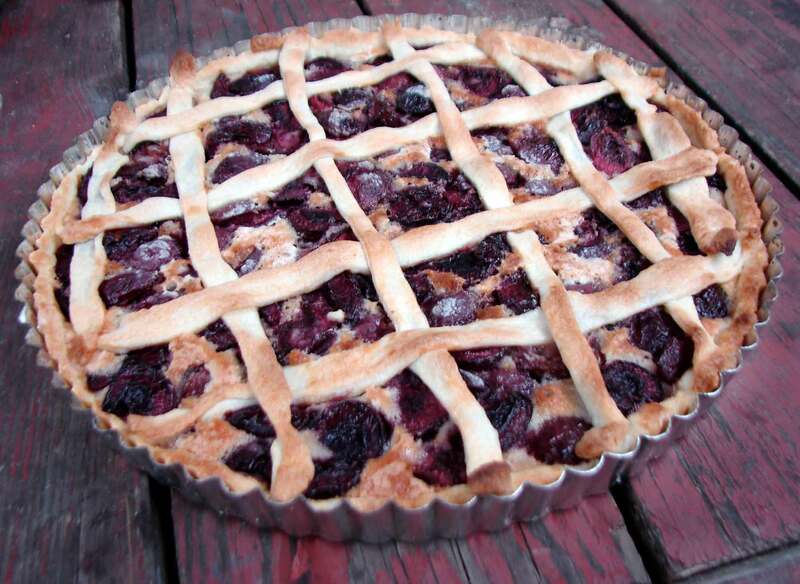 Use these to make a lattice on top of the pie–or any shape you like. Bake for 45 minutes to an hour, till the dough is firm and golden brown. Let cool, slice and serve with lightly sweetened whipped cream or vanilla ice cream. 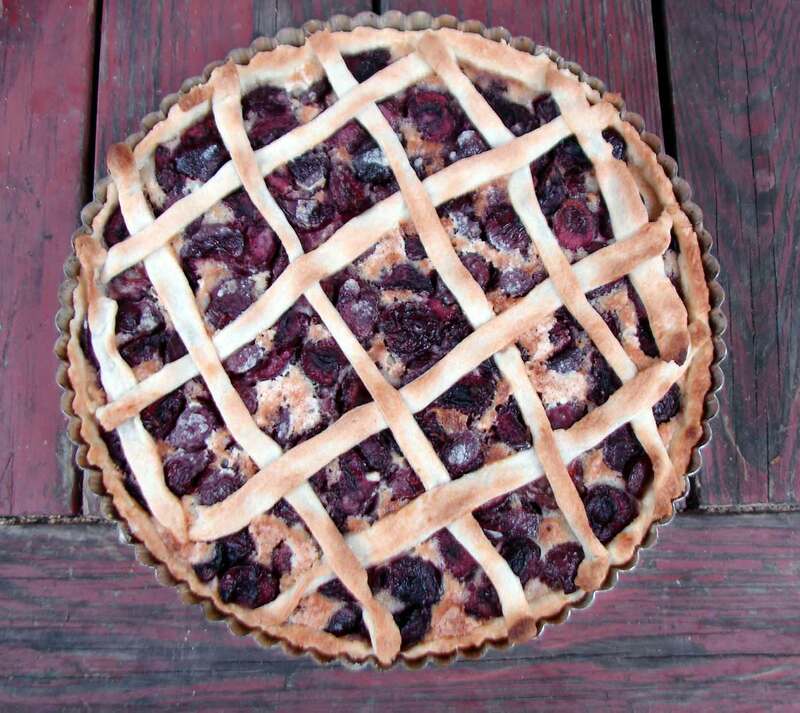 This entry was posted in basic pie filling, chocolate, cookie, crust, dessert, recipe and tagged cherry chocolate tart, cherry tart, fresh cherry pie, simple cherry pie by Claire. Bookmark the permalink.